There are two basic types of pull-up bars on the market: removable and permanent. 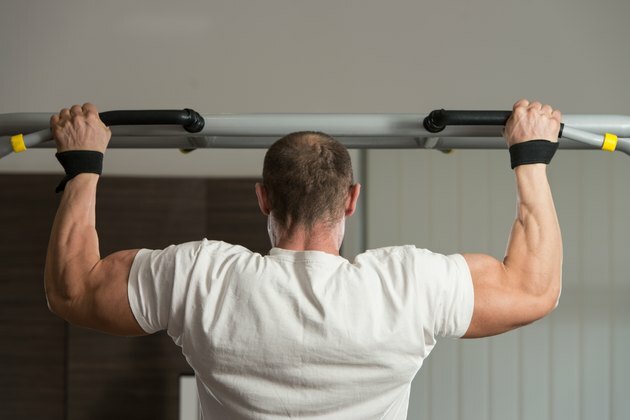 Removable pull-up bars are relatively lightweight, inexpensive solutions for those who do not want to drill or permanently mount their pull-up bar. These types of pull-up bars mount inside of a standard doorway and are secured in place by leveraging your own body weight to hold the device tightly against the wall and trim/molding during the exercise. Removable chin-up bars require no drilling or fixed mounting, but permanent pull-up bar installations do. While they are tougher to install than a removable model, permanently mounted pull-up bars support more weight and usually last longer if installed correctly. Determine where you want to mount your pull-up bar. There are different types of permanent pull-up bars on the market, including joist-mounted, ceiling-mounted, wall-mounted, corner-mounted, or doorway-mounted. Each type of installation will require a different set of brackets and hardware, so make sure to plan out the type of pull-up bar installation you want before you buy. The necessary hardware will be included in the purchase of your pull-up bar. Measure out the proper distance needed to mount the brackets that will support the pull up bar. This will vary depending upon where you choose to mount your unit as determined in Step 1. Use a pencil to mark the locations where you will drill the pilot holes for the brackets. You may need to use a stud finder to find a stud, rafter or floor joist. You must mount the brackets securely in wood, metal or concrete to provide enough support throughout the exercise. Drill pilot holes for the brackets, which will help to avoid cracking in the stud or floor joist over time and will also make it easier to install the mounting bolts. If your particular model features a removable pull-up bar that comes with two sets of mounting brackets, you should repeat steps 2 and 3 to mount the second set of brackets in a different location. For example, you could mount one set of brackets high up on the doorway, and mount the second set slightly lower to accommodate shorter people. Insert the mounting bolts into the pilot holes, and tighten them using the socket set or an adjustable wrench. If your included hardware pack comes with screws for mounting the brackets, use the driver drill to fasten them securely. Fit the bar into the newly installed mounting brackets and give it a tug to make sure it’s secure. Now hang from the pull-up bar to ensure that it will support your weight. If the bar supports your weight properly, you can begin doing your chin-up exercises whenever you’re ready to go. Don’t mount doorway pull-up bars too close to the top of the doorway. If you do, you’ll have no clearance for the bar or your hands during the exercise. Plan out your pull-up bar installation before you buy it. It’s a good idea to take some preliminary measurements before you actually buy the bar to ensure proper fit in the space. Use only the manufacturer-recommended mounting bolts to ensure maximum weight capacity. Never mount a pull-up bar in drywall alone. It must be secured in a stud, floor joist, doorway, concrete or rafter to ensure durability and safety. Do Pull-Up Bars Damage Doors?